Does BYU really expel LDS students and kick them out of their housing and on-campus jobs if they change their beliefs? Yes, it does. Please visit our Overview page for more details. Nonmember students pay a higher tuition. Wouldn’t it be a problem for students to choose a different religion when they pay LDS tuition? We recommend that if LDS students choose to pursue a different faith, their tuition should be changed to the standard nonmember rate. As it currently stands, students are often forced to keep their personal beliefs hidden to remain in school, with the result that they pay the lower LDS tuition even though they have different beliefs and may not be likely to pay tithing after they graduate. Allowing LDS students to change their religious affiliation would actually permit them to pay tuition more fairly. How should BYU’s policy be changed? Non-LDS students who change their faith can already do so with minimal disruption to their lives. We recommend that BYU’s policy should be updated to extend the same flexibility to LDS students at the University. LDS students who convert to other faiths should be expected to begin paying nonmember tuition just like other nonmembers at the University. How does the Honor Code limit religious freedom if students can choose to leave BYU? It is true that students do not have to stay at BYU, and can thus change their religious beliefs at any time. However, the implications are often so overwhelming that exploring other beliefs about God simply seems out of the question. LDS students who honestly explore their faith do so at risk of being expelled from school, evicted from their homes, and fired from their jobs – not to mention the significant social and familial repercussions that are sure to follow. BYU’s policies ensure that if LDS students change their beliefs, the repercussions are needlessly life-altering and disruptive. This makes the honest pursuit of truth a difficult and frightening prospect for many people. The question is not whether BYU violates religious freedom from a legal standpoint, but whether it is ethical for BYU to establish coercive policies that make it difficult for students to follow their personal religious convictions. How does BYU’s faith policy affect the University and the LDS Church? The symposium invites delegates from all over the world. For example, while volunteering there, I met a high-ranking Mexican government official who was in charge of deciding how many visas are granted to Mormon missionaries in Mexico. The Church paid for her travel, hotel rooms, food and entertainment for a week in Provo so that she could attend the symposium and therefore understand the importance of promoting religious freedom in her country. Widespread understanding of BYU’s intolerance for changes of faith could have devastating consequences on worldwide missionary work. How does BYU’s faith policy affect students? Most LDS students who come to BYU do so as strong, active believers in the doctrines of the LDS Church and thus have no problem signing the Honor Code – usually as teenagers – which forbids them from changing their personal beliefs about God while studying at BYU. However, for many students, college represents a time to explore and discover their personal beliefs. It may be the first time many students start to find their own faith instead of relying on the faith of their parents or their peers. This is a process that everyone must eventually go through. [The Savior’s] deliberate use of Jews and Samaritans clearly teaches that we are all neighbors and that we should love, esteem, respect, and serve one another despite our deepest differences—including religious, political, and cultural differences. It is unfortunate that, during this difficult time when students would benefit most from the principle of inclusion that Elder Ballard discusses, they are instead faced with institutionalized exclusion. It is hard to imagine a policy being more contrary to the principles of love and religious freedom that are so important to BYU and the LDS Church. The policy is even more damaging because students not only face dismissal from BYU, but from their housing and their on-campus jobs as well. LDS students who change their religious beliefs publicly will have their lives turned inside-out. They are dismissed from their school (no matter how close they are to graduation), they are evicted from their housing, and they lose their on-campus jobs – and all of this at a time when they are often suffering emotionally during a transition in faith and belief. Can it really be said that BYU’s heavy-handing belief policies are in-line with its commitment to Christlike love, inclusiveness, and religious freedom? The Honor Code is a contract, and every student signed it before applying. Why would it be wrong to hold them to that contract? To be clear, we are not suggesting that students shouldn’t be held to the contract that they signed as adults. LDS students who do change their beliefs shouldn’t be surprised when they are held to the contract that they signed before enrolling. We are, however, suggesting that it is in the best interest of BYU and the Church to change the contract so that it is in harmony with BYU’s commitment to religious and academic freedom (see Overview for more on this subject). Can’t students who change their beliefs just reapply as nonmembers? The Honor Code clearly states that “Former LDS students are not eligible to receive an ecclesiastical endorsement.” This statement applies not only to endorsements from LDS bishops, but also to endorsements from non-LDS religious leaders and the BYU chaplain. Without an endorsement, no student can attend BYU. But even if in rare cases exceptions are granted, the damage caused by expelling a student mid-semester, terminating his employment, and evicting him from his apartment is both unnecessary and inexcusable. If a student leaves the church, they are obviously not living in harmony with the Honor Code – otherwise they wouldn’t leave. This is simply untrue. 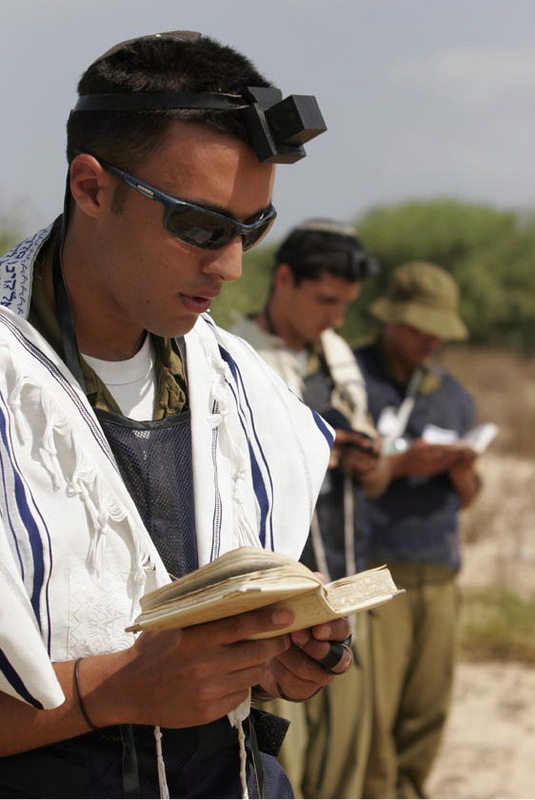 Many members struggle with their personal testimonies for reasons other than sin. Elder Uchtdorf spoke of this in the 2013 General Conference. When students leave the church, aren’t they violating covenants? Aren’t they violating the honor code by being dishonest? It is worth noting that the Honor Code places no restrictions on the ability of nonmember students to change their religions, regardless of whether they made promises or covenants in their previous religions. We shouldn’t ask more of a student than that she honestly pursue truth in the best way she knows how given her understanding of truth. 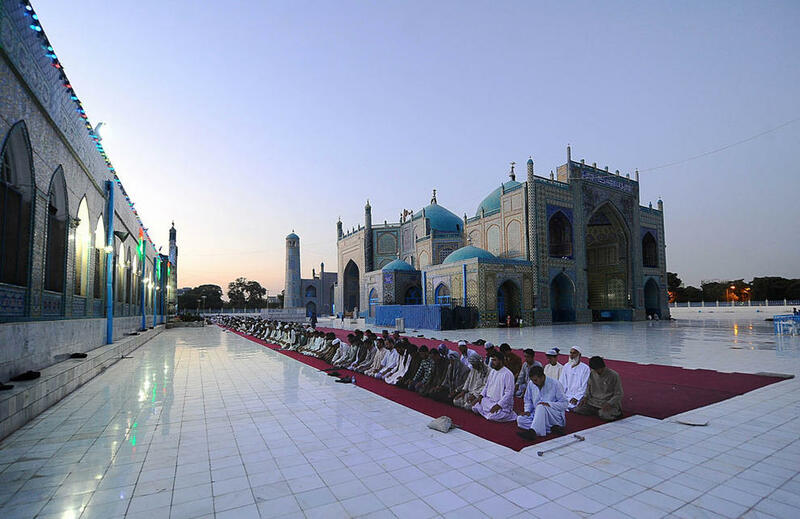 From the perspective of a Muslim student who converts to Mormonism, promises made in error as a Muslim should not prevent her from pursuing additional truth when she has found it. Similarly, from the perspective of a Mormon student who converts to Catholicism, previous promises made in error (as far as he can tell) should not stop him from worshiping God in as genuine a way as possible. BYU implicitly recognizes this principle when it allows members of other religions to convert to Mormonism while at BYU. To be consistent, it would make sense to take the principle one step further and allow students to follow their conscience in the other direction. If we have the truth, we should do everything we can to keep people in it. Isn’t it better that BYU’s policy makes it hard for people to change their faith? In our experience, students tend to explore their personal beliefs despite the restrictions placed on them by BYU’s belief policies. When students do decide that they feel differently about their personal relationships with God, they are forced to either keep their beliefs a secret, or to leave the school. This often produces a great deal of stress and bitterness against both BYU and the LDS Church. In short, BYU’s faith policy likely does little to keep our young people in the church, but it does create bitterness, hurt, depression, and anger. Can’t students appeal their expulsion? The decision to withdraw an ecclesiastical endorsement may be appealed through appropriate ecclesiastical leaders only. As a matter of practice, BYU does not intervene in ecclesiastical matters or endorsements. In unusual circumstances, however, a student may petition the Dean of Students Office to allow an exception to the ecclesiastical endorsement requirement…. The student bears the burden of persuasion that he or she should be considered to be in good Honor Code standing, notwithstanding the lack of an ecclesiastical endorsement. 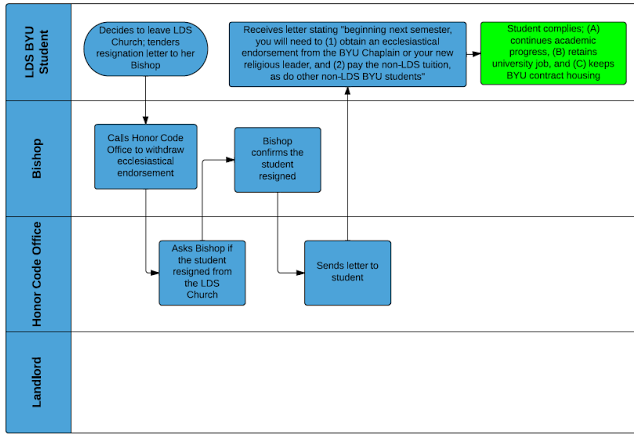 Considering that the Honor Code makes it clear that former LDS students are not eligible for an endorsement from any source, and since it specifically states that disaffiliation with the LDS church will result in expulsion (independent of the endorsement), it is highly unlikely that exceptions will be granted. At best, exceptions are extremely rare. But even if exceptions were easier to obtain, requiring students to file an appeal in order to remain at school, prevent eviction, and keep their jobs is both unnecessary and harmful. This is particularly so when the only grievance against a student is that he pursued his personal religious beliefs in good conscience.